My wife Mandy and I just returned from our trip to NYC and during this visit we got to see a brand new park that just opened a couple of weeks ago. I thought it was such a great idea and designed so well that I had to share. Mandy’s Aunt is a fantastic person and a great person to show you New York City. She gave us a little background on the High Line. The High Line is an old railway that runs throughout Manhattan. Its a couple of stories off the ground and runs alongside and through buildings, over streets and pedestrians, and gives a very unique view of the city. It was abandoned a couple of decades ago and just a couple of weeks ago was re-opened as High Line park. Every little piece is designed beautifully, from the seating, to the design of the walk way. Add it to the list of must see sites in NYC. 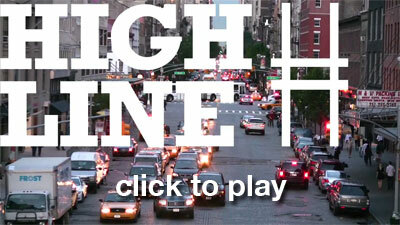 For more videos and info about the park visit thehighline.org. Projects like that help to restore my hope for humanity. And reaffirm my belief that I would probably love living in NYC.